It's late in the afternoon, it's only Tuesday, and you feel like a goddamn hero for even making it this far into the week. You deserve a prize, a treat, a major award. Oh, we know: Why don't you head on over to Dodge's website and build yourself a tasty Dodge Challenger SRT Demon on its newly-released configurator? Yes, that will do nicely. In this world, where shady dealers don't exist and we all have a spare $90,000 lying around, it's now possible to build the Dodge Demon exactly how you want it. It's honestly pretty amusing to be able to spec out an 840-horsepower rocket ship like it's any other car, but it only takes a glance at the standard features like passenger/rear seat delete and Drag Mode suspension to squash that notion. But yes, for the base price of $84,995 (not including a $1,095 destination charge), you get the world's fastest quarter-mile production car, capable of lifting the front wheels at launch and laying down a 9.65-second, 140-mph run. 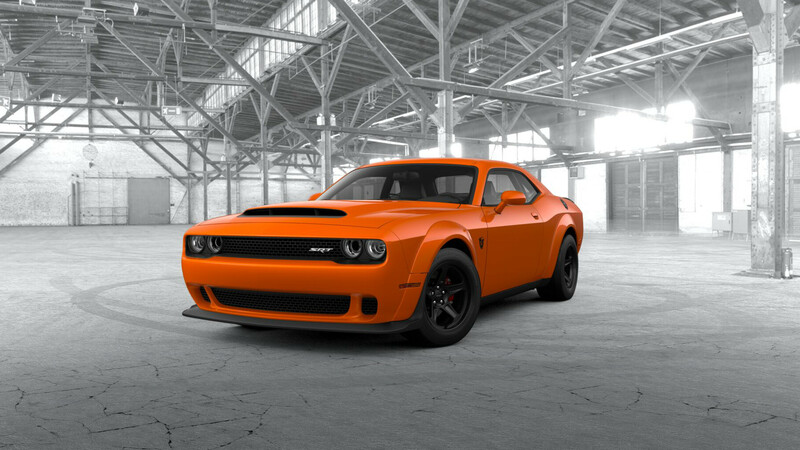 Once you click through the standard 6.2-liter HEMI V-8/TorqueFlite eight-speed autobox powertrain option, the Demon's unusual batch of $1 options are revealed, including passenger and rear seats, as well as a trunk carpet kit. Heated and ventilated leather seats are a $1,595 option, though it doesn't appear that leather is available with the passenger seat delete setup. Black is the only interior color option, but you can spice it up a bit with red seat belts for $195. Two "Comfort Audio Group" packages are offered to spruce up the interior a bit. With cloth seats, it includes an 18-speaker Harman Kardon audio system and floor mats. But opt for the $2,495 leather version and things get decidedly more deluxe, adding a heated and power-adjustable steering wheel and Alcantara sport thrones on top of the fancy stereo. While both require a passenger seat, neither require rear chairs, if you're looking to help offset the pounds those goodies pack on. On the outside, 12 of the 15 different paint options are available at no charge, including the excellent Go Mango and TorRed. A satin black hood will run you $1,995, while a whole graphics package bumps that up to $3,495. Finally, we come to the most notorious option on the list—the $4,995 sunroof. Apparently, Dodge would really prefer not to cut a hole in a structural piece of their factory drag racer, but we're willing to bet at least a few will be ordered with a needlessly heavy roof. In case you're looking for inspiration, we've spec'd out The Drive's Dodge Challenger SRT Demon—and ended up with $89,061 worth of raw-but-refined speed. It's finished in pure Go Mango, with none of that satin junk adding to the noise. On the inside, we went with the Leather Comfort Audio Group—even though it adds weight and complexity, those ventilated front seats will sure come in handy when the car's air conditioning system prioritizes cooling the engine over the human behind the wheel. Plus, we're still leaving out the rear seats. One screaming passenger is plenty. We've also opted for the $1 trunk carpet kit, if only for the option of using it for lightning-speed grocery runs, and a storage package that includes a branded car cover and battery tender. But that's just for completion's sake. We don't expect it to spend much time in the garage. Rhys Millen takes the wheel to show off the Demon's slideways prowess. John Hennessey wants to give Demon owners the chance to unlock their vehicle's full potential.